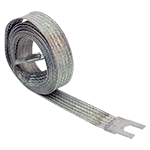 Electrical lead tinned ground braid with lugs. 150 amp. 10 foot long, 1" wide. New in package. NSN: 4940-00-752-2525. 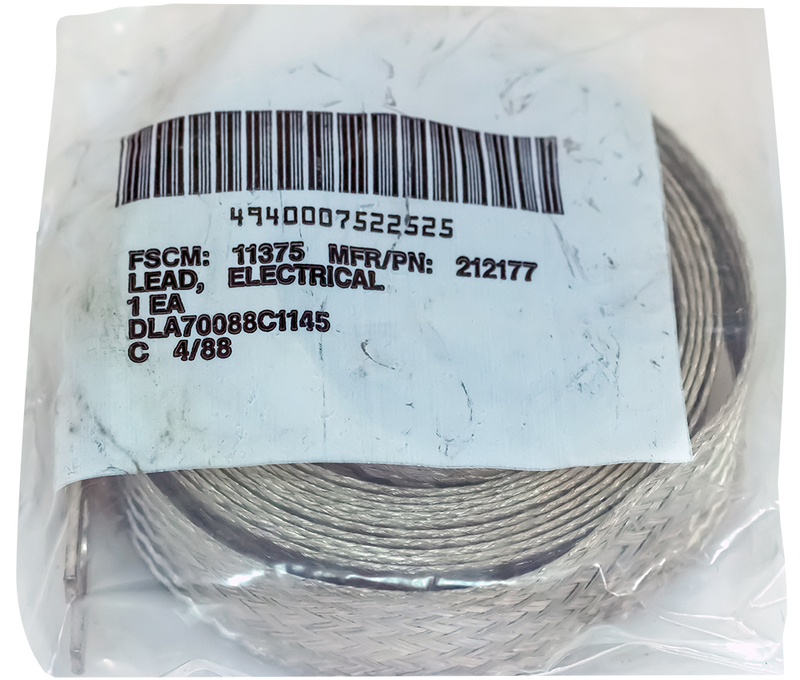 Nickel plated copper braid wire. Silver connectors. 20 amp capacity. 3/32" diameter cable. Ground temporary, portable equipment. If operator forgets to unplug -- Disaster averted! Also can be used as an alarm ground fault. 6-1/2" long when assembled. 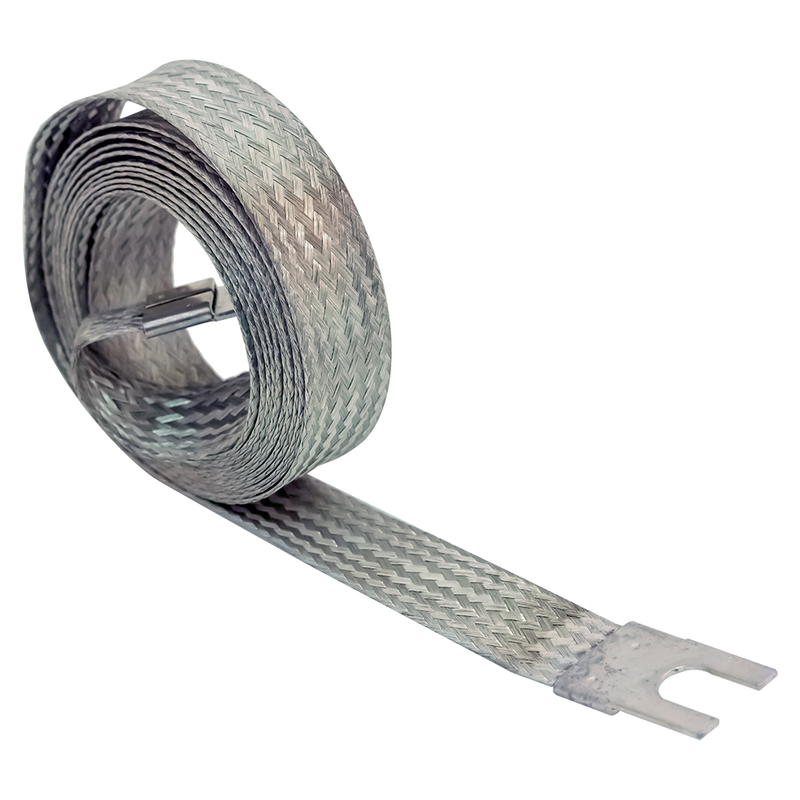 Belden hook-up / lead shielding and bonding cable. 36 amps capacity. 0.21" wide, flat. 0.072" thick. 13.3 AWG (11/64"). Braided tinned copper. 0.170" inner diameter. 2.17 ohm / 1000 feet. 4,800 circular mills. Ground braid. 0.026" thick. 16 amps. Tubular. 5/64" round, tin. 0.115" wide - flat. Alt. P/N: AA59569R36T0078. Anixter ground braid. 0.060" thick. T/C tubular. 46 amps. 0.268" wide - flat. 0.203" round. RoHS. Ground braid. 0.060" thick. 55 amps. 9/32", 0.281" wide - flat. Alt. P/N: UA-7957904-02. Ground braid. 0.135" thick. 190 amps. Measures 1" flat. 0.965" wide - flat. Copper / tinned. New England Electric copper braid. 1" thick. 2% silver plate. Lenz cloth core copper braid. "Voice Coil Wire". 16-40 GA conductors woven into a 22 GA braid. Bare copper. Lenz P/N: 1640. NSN: 6145-160-6170. Tinned copper 3/4" braid. 16" long. Flat copper lug attached on each end with 0.345" bore. 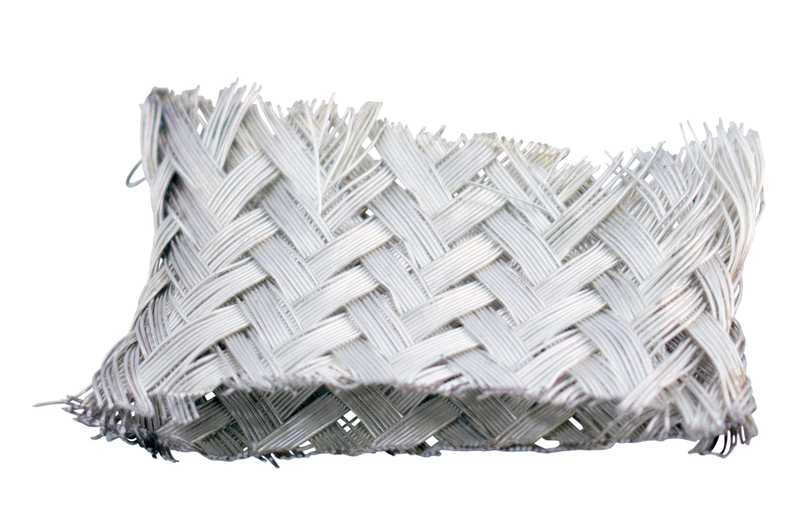 Knitted wire mesh. Tubular tinned copper. Minimum 0.343" outside diameter, 0.27" inside diameter. 5999-01-216-6466. Copper grounding lead. 12 AWG, 27" long. 37 strand, very flexible. 110 pound pull strength. Terminal lug aperture = 0.2". NSN: 6150-01-244-0540. Belden #24 (16 x 36) tinned copper ultra miniature bonding braid. 0.025" diameter. Tinned copper 1/2" braid. 10" long. Flat copper lug on each end with 0.345" bore. NSN: 5995-00-173-7116. 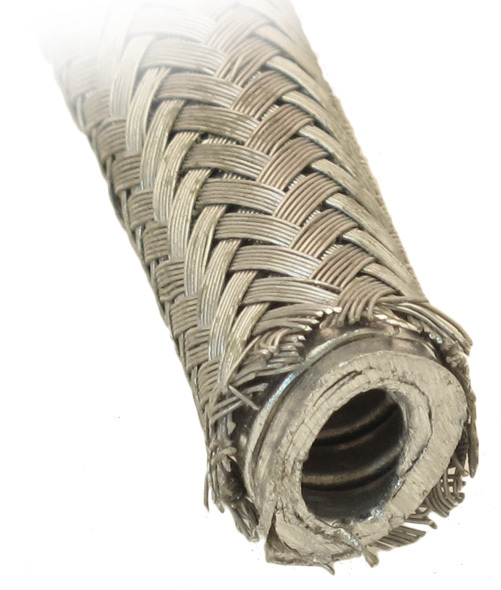 Braided shield on the oustide, flexible metal conduit on the inside. 3/16" inside diameter, 13/32" oustide diameter.